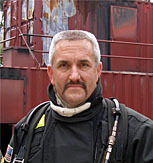 I originally intended to write this post about the influence of air track on flashover in multiple compartments. However, after several conversations in the last week about the bathtub analogy and ventilation induced flashover, I had a change in plans. 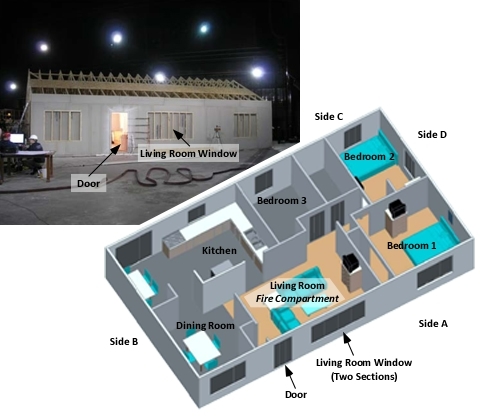 In Understanding Flashover: Myths and Misconceptions, I presented the bathtub analogy (Kennedy & Kennedy , 2003)as a simplified way of understanding how flashover occurs when a compartment fire is burning in a fuel controlled regime. 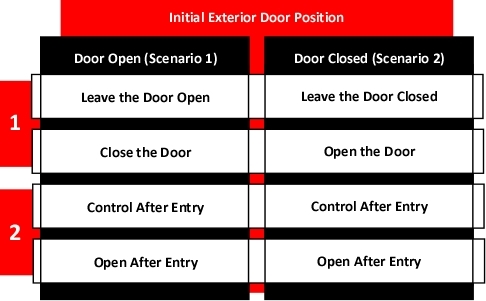 Note: Adapted from Flashover and fire analysis: A discussion of the practical use of flashover in fire investigation, p. 7, by Patrick Kennedy & Kathryn Kennedy, 2003. Sarasota, FL: Kennedy and Associates, Inc. While the bathtub model provides a simple explanation and makes it easy to understand how flashover might occur, it is inaccurate. However, as Box and Draper (1987) stated: “Essentially, all models are wrong, but some are useful” p. 424). Models or analogies provide a way of understanding based on simplification. This is useful, but this simplification, while providing a starting point for understanding can overlook important concepts or elements of a complex system. In the case of the bathtub analogy, simplification overlooks the criticality of oxygen to the combustion process. Ventilation is the exchange of the atmosphere inside a compartment with that which is outside. 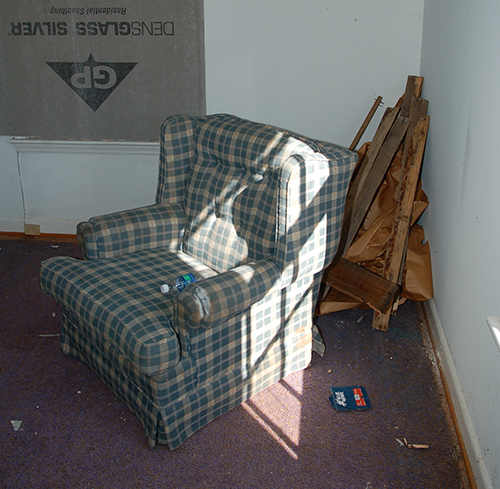 This process is necessary and ongoing in any space designed for human habitation. 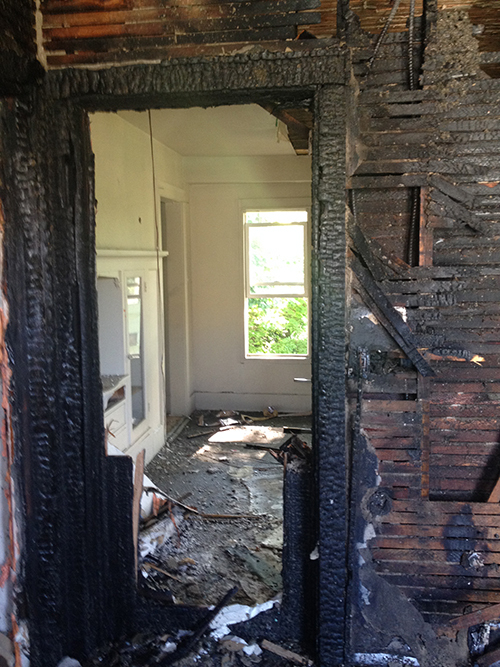 In a compartment fire, ventilation involves the exhaust of smoke and intake of air from outside the compartment. 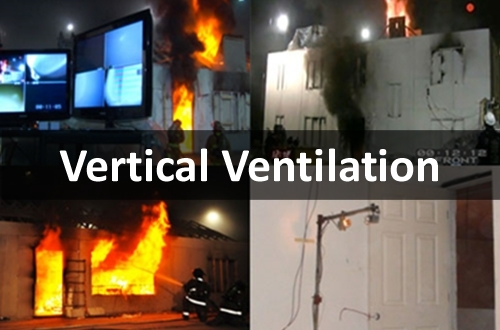 �Note that this is different than tactical ventilation, which is the planned and systematic removal of hot smoke and fire gases and their replacement with fresh air. However, both normal and tactical ventilation involve exhaust of the compartment atmosphere and replacement with fresh air. 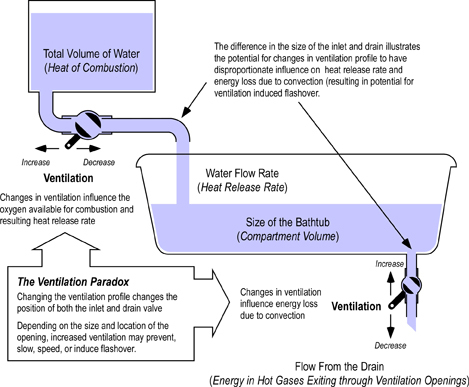 While the bathtub analogy is simple, and provides a useful starting point, it fails to address the air side of the ventilation equation. 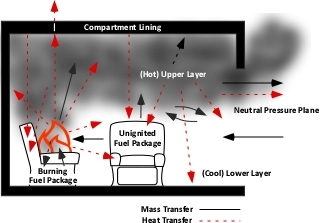 As ventilation is increased, the compartment looses energy through convection. 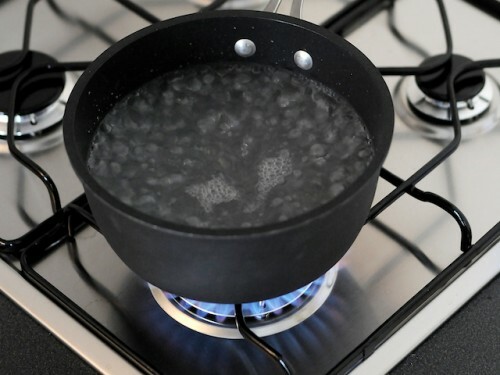 However, if the fire is ventilation controlled (heat release rate (HRR)is limited by the available oxygen), increased ventilation will also increase HRR. 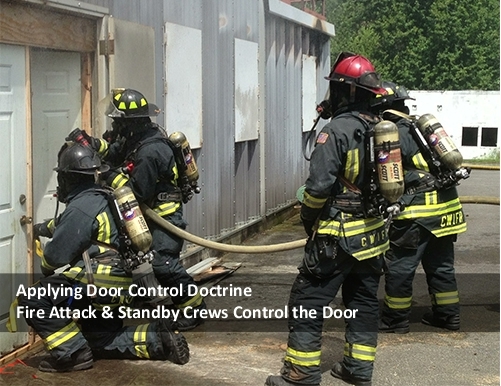 For many years, firefighters have been taught tactical ventilation prevents or slows progression to flashover. 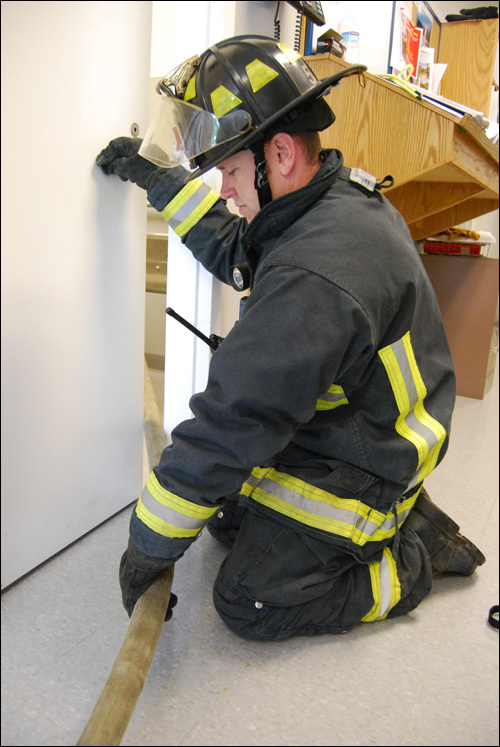 Somewhat less commonly, firefighters have been taught to close the door to the fire compartment, limiting inward air flow and slowing fire growth (tactical anti-ventilation). 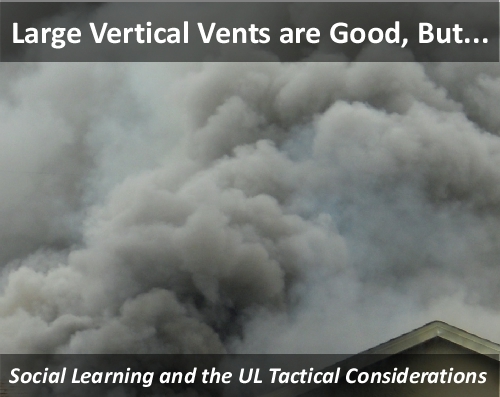 My friend and colleague Inspector John McDonough of the New South Wales (AU) Fire Brigades refers to this as the Ventilation Paradox. 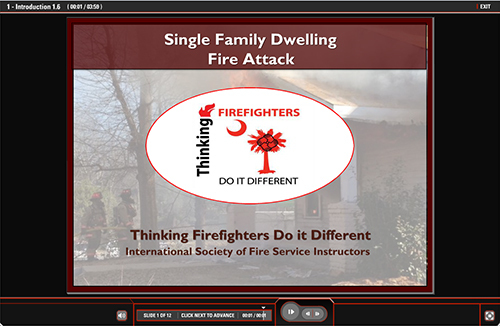 Increased ventilation increases the HRR required for flashover to occur and may prevent or slow progression to flashover or it may (and often does) result in flashover. 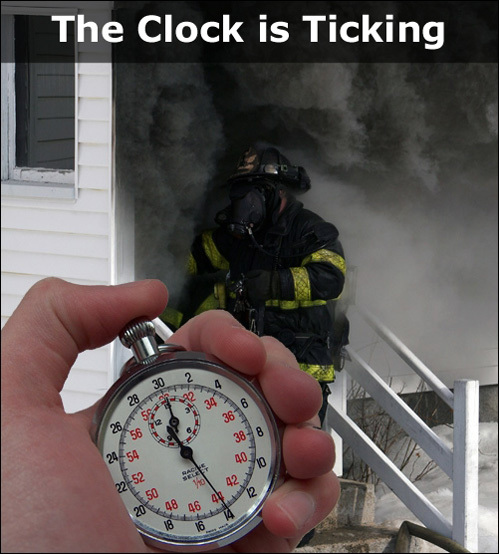 Reduction in ventilation may prevent or slow progress to flashover, but also reduces the HRR required for flashover to occur and (less commonly) may result in flashover. It depends! Not the answer that firefighters want to hear. 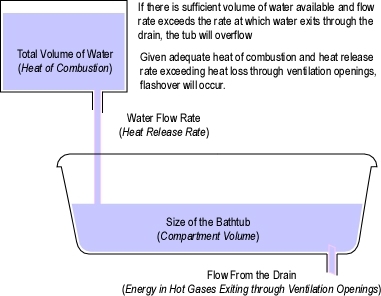 Making the bathtub analogy a bit more complex may provide a starting point for understanding the ventilation paradox. At the root of this apparent paradox is the impact of ventilation on the thermodynamic system and the relationship between oxygen and release of energy from fuel (Thornton’s Rule). See Fuel and Ventilation [LINK) for more information on Thornton’s Rule and the relationship between oxygen, fuel, and energy. 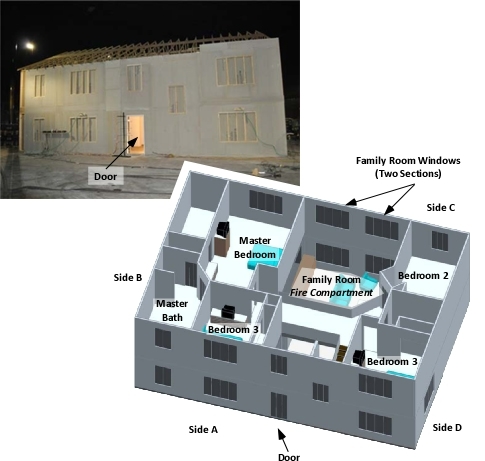 As illustrated in Figure 2, the revised bathtub analogy incorporates several changes. The inlet pipe has been enlarged (making it larger than the drain) and valves have been added to both the inlet and drain pipes. Most importantly, control of the valves is interconnected (but this is not shown visually as it makes the drawing even more complicated). Changing the position of either the inlet or drain, results in a corresponding change in the other valve. 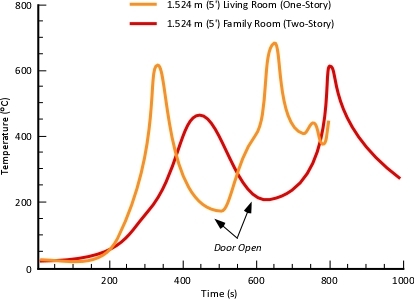 This analogy provides a reasonable (but still overly simplified and thus somewhat inaccurate) representation of a ventilation controlled compartment fire when normal building openings (e.g., doors, windows) serve as ventilation openings. 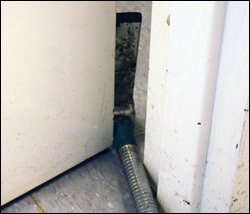 As illustrated in Figure 2, opening the drain also results in an increase in flow from the (larger) inlet, which without intervention is likely to result in the tub overflowing. 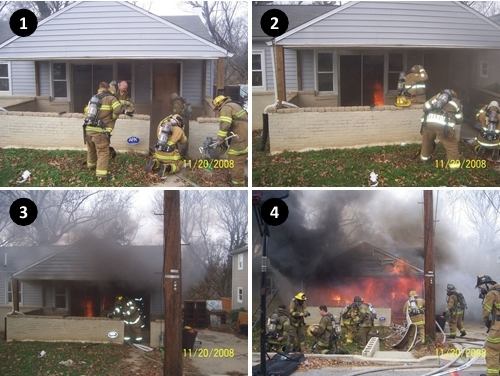 In a compartment fire, increasing ventilation to a when the fire is burning in a ventilation controlled regime, increases convective heat loss, but HRR will also increase, potentially resulting in flashover. 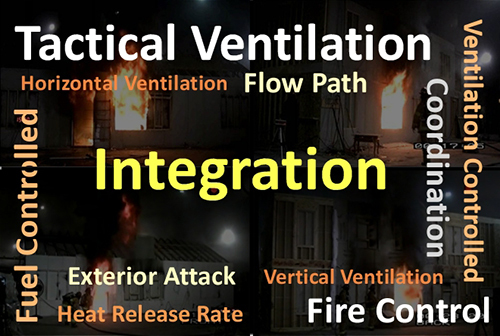 Resolution of the problems presented by the paradox involve recognition of what burning regime the fire is in (fuel or ventilation controlled), understanding the influence of the location and size of ventilation openings on convective heat loss, understanding the influence of increased air intake on HRR, and coordination of ventilation and fire control tactics. On the surface, this all sounds quite simple, but is considerably more complex in practice. I would like to thank my friend and colleague Lieutenant Chris Baird, Gresham Fire & Emergency Services and my wife Sue for serving as my sounding board as I worked through the process of revising the bathtub analogy. As always your feedback and suggestions will be greatly appreciated. Box, G.& Draper, N. (1987). Empirical Model-Building and Response Surfaces, San Francisco: Wiley & Sons.